The inside of the 2017 Chrysler Pacifica has seating for eight and a large amount of cargo capacity. As an added bonus, the Stow n’ Go Seating and Storage system makes it easy to flop back and forth between maximum passenger or cargo capacity. It literally only takes a matter of seconds to get a seat folded down or up. With this system, the middle and back row seats are effortlessly stored in bins located in the floor of the Pacifica. No longer will van owners have to struggle with physically lifting the seats out of the van for increased cargo space. Now, just fold the seats down in a matter of seconds in order to gain the desired amount of cargo space. Which is another great thing about the system; it’s not an all or nothing deal. If folding down the third row seats to create extra cargo room for your groceries is your desire — but you still need five available seats for the kids and family — the Pacifica delivers both. Need a configuration that gives taller passengers more leg room? Simply fold down the second row of seating and put them in the third row, that way they have all the room they’ll need to stretch out and stay comfortable. In total, the Stown n’ Go system provides you with up to 243 different kinds off seating configurations; safe to say, that makes the Pacifica the most versatile vehicle in its class. Especially since it’s the only van on the market equipped with the Stow n’ Go system that has storage for the second row of seats. With all of the seats folded down, the Pacifica boasts 140.5 cubic feet of storage space. When all the seats are up, the Pacifica provides comfortable and spacious seating for eight passengers. The driver seat has 12-way power adjustability, including four-way adjustable lumbar support. For cold winters and warm summers, the available heated and ventilated seats are welcome with open arms. The seating and storage space isn’t the only thing in abundance on the 2017 Chrysler Pacifica. It also has over 100 standard and available safety and security features. So regardless of what type of situation arises on the road, the Pacifica has an answer for it. It has all the great advanced technology features that 2016-2017 has to offer, like forward collision warning, a rear back up camera, adaptive cruise control with stop and go technology, 360-degree surround view camera, lane departure warning, and blind spot monitoring. Lane departure warning with lane keep assist functions just like it sounds, by using a camera-based vision sensor to detect the intended path of the vehicle. If the system picks up on an unintentional lane change, which is determined by a lane change without a blinker, the system will engage and provide a visual warning. It can also monitor if the driver’s hands are on the steering wheel or not, and uses that as another way to judge whether or not an unintentional lane change is occurring. Chrysler claims that their adaptive cruise control with stop and go technology is the next phase in the evolution of safer cruise control and it’s easy to see why. 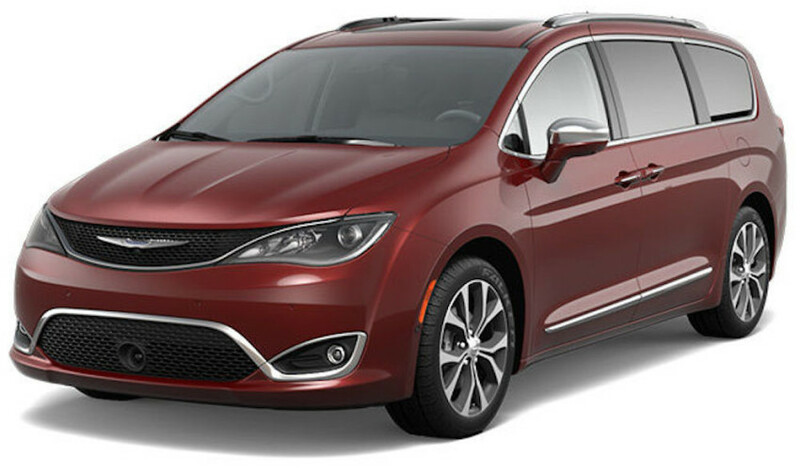 With this more intelligent cruise control system, radar and video sensors are used to help identify vehicles in the path of the Pacifica, in turn allowing it to remain a safe distance behind said vehicle. If the vehicle drastically decreases its speed, the system will sense danger, and stop and go technology will kick in to provide full-stopping power anywhere between 0-100 mph. If necessary, it can even hold the vehicle at a stop indefinitely until it’s safe to accelerate again. Some of the standard safety features on board are traction and stability control, anti lock disc brakes, side curtain, front seat side, and driver and front passenger knee airbags, and a rearview camera. The subscription to Uconnect Access offers emergency assistance, vehicle location service, and remote door locking/unlocking — and there are still many more standard and available features. The 2017 Chrysler Pacifica also has you covered on the entertainment and convenience side of things. While convenience functions, like hands-free sliding doors and lift gate are available, the real star here is the Uconnect Theater, providing entertainment and convenience from the front to the back of the Pacifica. In the front, it all starts with the 8.4-inch Uconnect touchscreen interface with 12-month connectivity. This system provides things like hands-free calling and other voice command functions with a Bluetooth compatible phone, GPS capability, and connectivity to Sirius XM radio, which provides over 200 plus channels of satellite radio and TravelLink to keep you updated on weather and traffic. The tunes you choose can come out of an available 20-speaker Harman Kardon premium surround sound system, providing crystal clear highs and concert-kicking lows — effectively enveloping you and your passengers in pure musical bliss. If music doesn’t interest the kids sitting in the back, then the Uconnect Theater has two 10.1-inch setback touchscreens. This dual-screen Blue-Ray and DVD entertainment system allows the integration of devices like phones, tablets, laptops, and even gaming consoles in order to watch movies and play games. Or they can select from a collection of games that come standard with the program, such as Checkers, Hangman, and a technological twist on the license plate game. That way, the rear passengers can immerse themselves in their own form of entertainment. Thankfully, the system comes with a pair of headphones, so dad and mom can still enjoy their music while the kids play their games in peace. Let’s face it, as much as families love each other, everyone needs a little me time on a long car ride. The Faricy Boys reserves the right to determine whether a 24-hour hold can be honored based on vehicle availability or prior customer interaction. A representative from the dealership will be reaching out to make contact and confirm the appointment. In order for this 24-hour hold to be valid, you MUST respond to our email, call or text to confirm the appointment date & time. Vehicles cannot be reserved for more than 24 hours. Vehicles are not available to reserve within the first three days due to reconditioning process. Even if it isn’t the 2017 Chrysler Pacifica you are looking for, we at The Faricy Boys still have plenty of other well-loved models in stock, like the 2016 Jeep Grand Cherokee, Wrangler, Chrysler 300, and many more new Chrysler and Jeep vehicles. Apart from these models, we also have a broad selection of pre-owned and certified used cars available for your consideration. If you are just looking for a place to get some parts for your current Jeep or Chrysler vehicle, browse our incredible selection of OEM car parts. If you can’t find what you are looking for, chances are we can order it for you quickly. Our service department is also top-notch and is housed in a state-of-the-art service center where our expert maintenance department is ready and waiting to help keep your car healthy and on the road for as long as possible. Our sales staff believes in transparency when making deals, so we have real prices with no hidden charges. Why? Because we’ve been family-owned for over 73 years, so our honest, trusting, and caring family values are inherent in our business practices as well. To help prove we truly care, we ensure a full tank of gas included on all new cars purchased, a courtesy other dealerships rarely offer. With family values imprinted on knowledgeable and expert staff, and a wide selection of new and used cars, what more could you ask for? The Faricy Boys	38.9391414, -104.7361381.